Under the hood of most vehicles exists a network of wires which have a necessary function, but certainly create clutter in the engine bay. All the go-fast parts and chrome accessories in the world can go unnoticed if the mess of wiring under the hood isn’t tamed. Fortunately, Spectre Performance not only offers go-fast performance upgrades and chrome accessories; but also offers accessories to clean up the mess of electrical wiring and spark plug wires under the hood. Not only can spark plug wire looms tidy up the engine bay, but they can also help maintain performance by separating the wires and possibly avoiding a misfire situation. 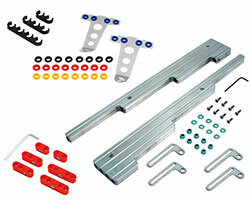 Spectre Performance offers spark plug wire looms and spark plug wire separators in a basic 7 mm plastic economy version all the way up to machined billet aluminum wire looms. 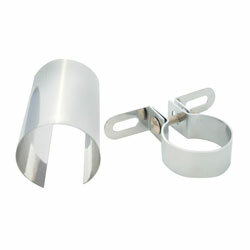 Another handy spark plug wire accessory from Spectre Performance is the set of spark plug wire markers. This set includes numbered rings, up to 8, as well as an installation and will help avoid mixing up wires when performing routine maintenance. The next logical step in organizing wires under the hood is Spectre Performance’s vast assortment of convoluted plastic tubing. 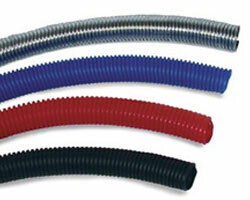 Spectre Performance convoluted tubing installs easily with a split running parallel along the length of the tube. Spectre convoluted tubing will protect electrical wires, and add a clean professional look under the hood or inside the vehicle. Spectre offers multiple size and color options to match most color schemes. Spectre convoluted tubing is available in 1/4 inch, 3/8 inch, 1/2 inch, 3/4 inch, 1 inch and 1-1/4 inch tubing sizes as well as optional colors including black, red, blue and chrome. 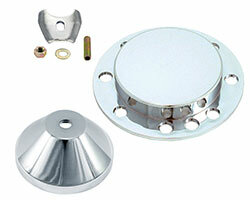 Spectre Performance offers additional chromed accessories to compliment chrome air cleaners, valve covers, and more. 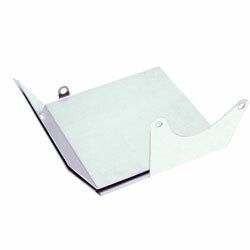 The Spectre Performance coil mounting bracket and coil cover, 45183, features a triple chrome-plated finish, with a design engineered for easy mounting either horizontally or vertically. The distributor system provides a crucial element in performance, yet is often overlooked when it comes to aesthetics. Spectre Performance makes dressing up a vehicle’s distributor easy with a chrome plated vacuum advance cover, HEI cover, and distributor hold downs for Ford and Chevy engines. A vehicle’s starter motor rarely crosses people’s minds, until it fails to work properly. Starter motor failure is usually caused by normal wear and tear over the course of years. However, in performance vehicles, especially those with aftermarket performance exhaust headers, heat can lead to premature starter failure. Spectre Performance offers a starter motor heat shield designed to fit many Chevrolet V8 and V6 engine block mounted starters. The Spectre Performance starter heat shield is designed to deflect engine or exhaust heat while looking great with its stainless steel finish. Since 1983 Spectre Performance has designed and offered unique, innovative, parts and components to fuel your car or truck obsession. Whether your fixation happens to be a custom hot rod, classic American muscle car, or even a modern pickup truck, Spectre will help fuel your passion for performance. Browse all Spectre automotive products by category at SpectrePerformance.com. While you are there use the Products by Vehicle Search to find Spectre performance products specifically made for your vehicle. To find a Spectre dealer near you use the Spectre Dealer Locator.